Once the heart of Gold-Rush era justice, Placerville was traditionally known as "Hangtown." Today its historic Main Street has locally pressed olive oil, artisan gelato, and the works of Placerville area artists as well as tastes of the past like the Cary House Hotel and the oldest newsstand and hardware stores in the west. A rafting trip on the American River is only a few miles away, as are popular destinations like Apple Hill, foothill wineries, and Marshall Gold Discovery State Park. Only 20 minutes from Placerville, Class III fun on the South Fork American River is perfect for first-time rafters and families. 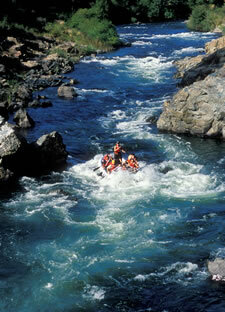 For a greater challenge, the Middle Fork American River offers intermediate Class III-IV whitewater in a wild canyon. The thrill of the North Fork American River during the springtime when its Class IV rapids are at their peak, is a great way to start off the rafting season.